The #1 New York Times bestselling author of A Man Called Ove and Beartown returns with an unforgettable novel "about people--about strength and tribal loyalty and what we unwittingly do when trying to show our boys how to be men" (Jojo Moyes). A small community tucked deep in the forest, Beartown is home to tough, hardworking people who don't expect life to be easy or fair. No matter how difficult times get, they've always been able to take pride in their local ice hockey team. So it's a cruel blow when they hear that Beartown ice hockey might soon be disbanded. What makes it worse is the obvious satisfaction that all the former Beartown players, who now play for a rival team in the neighboring town of Hed, take in that fact. As the tension mounts between the two adversaries, a newcomer arrives who gives Beartown hockey a surprising new coach and a chance at a comeback. Soon a team starts to take shape around Amat, the fastest player you'll ever see; Benji, the intense lone wolf; always dutiful and eager-to-please Bobo; and Vidar, a born-to-be-bad troublemaker. But bringing this team together proves to be a challenge as old bonds are broken, new ones are formed, and the town's enmity with Hed grows more and more acute. Here is a declaration of love for all the big and small, bright and dark stories that give form and color to our communities. 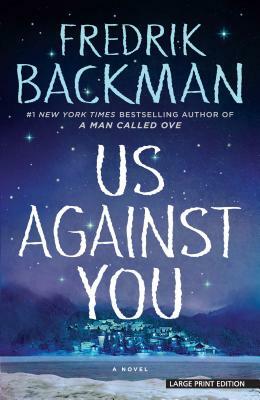 With immense compassion and insight, Fredrik Backman--"the Dickens of our age" (Green Valley News)--reveals how loyalty, friendship, and kindness can carry a town through its most challenging days.